Over half of all glycol ether consumption (including E-series and P-series) is for use as a solvent in various formulations, such as paints, inks, and cleaning fluids. Glycol ethers combine the solubility characteristics of both ethers and alcohols (or esters), as both functional groups (ether and hydroxyl [or carboxyl]) are present in the molecule. Nonsolvent uses for glycol ethers include hydraulic and brake fluids, anti-icing agents, and chemical intermediates. In 2017, the United States is the world’s largest producer and exporter of E-series glycol ethers, with China being the largest consumer, followed by Western Europe, and the United States. Growth in E-series glycol ether consumption will be greatest in China, followed by Africa and the Middle East. Overall, growth in the consumption of E-series glycol ethers will average 2.8% during 2017–22. 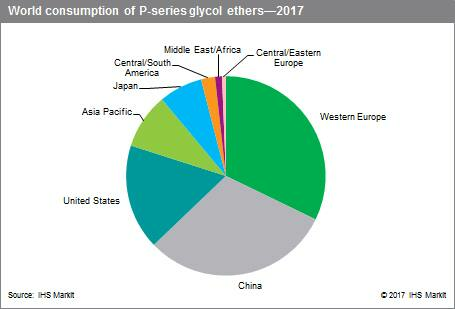 In 2017, Western Europe is the world’s largest producer and consumer of P-series glycol ethers, followed by China and the United States. Western Europe is also the largest exporter of P-series glycol ethers, followed by the United States and China. 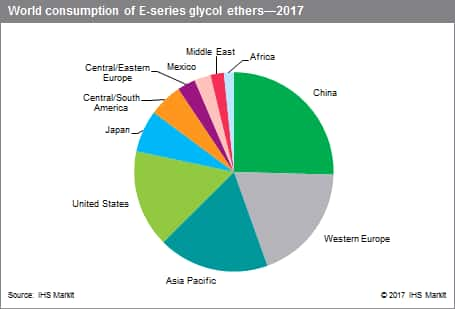 Overall growth in P-series glycol ether consumption will be greatest in China, followed by the Other Asia Pacific region and Central and Eastern Europe. On a global basis, P-series glycol ether consumption will be the faster-growing of the two glycol ether segments, averaging about 3.7% per year through 2022. Growth of water-based surface coatings as replacements for solvent-based coatings. The growth of water-based coatings that use glycol ethers as coalescing agents has been the major factor behind the growth of the entire glycol ether market. Growth of propylene oxide–based glycol ethers (P-series). This growth has been due primarily to increased concern about the toxicological effects of some ethylene oxide–based glycol ethers. Continuing changes in E-series glycol ether products. In the major regions of the world, growth has been primarily for the butyl products (and some smaller-volume specialty glycol ethers); the methyl and ethyl product groups have been in decline.